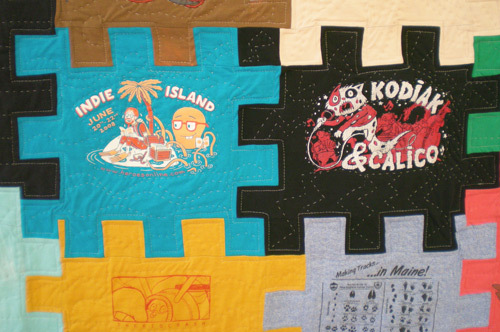 I made my first t-shirt quilt in 2008. It was comprised of shirts I wore in high school and college. 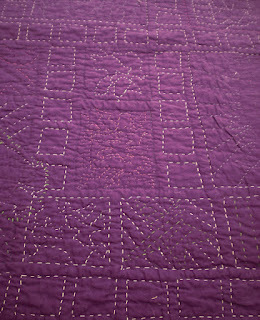 I pieced it by machine, but did the quilting by hand. It took a long time, but was a nice thing to sew during the winter. 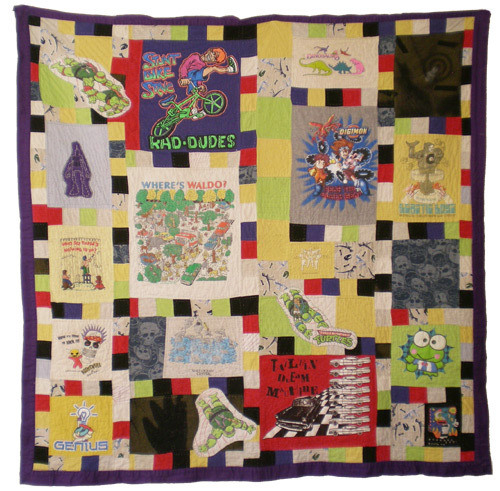 I think t-shirt quilts are a great way to keep all the memories that come along with clothing you don't wear anymore. Finished size 61 in. x 61 in. 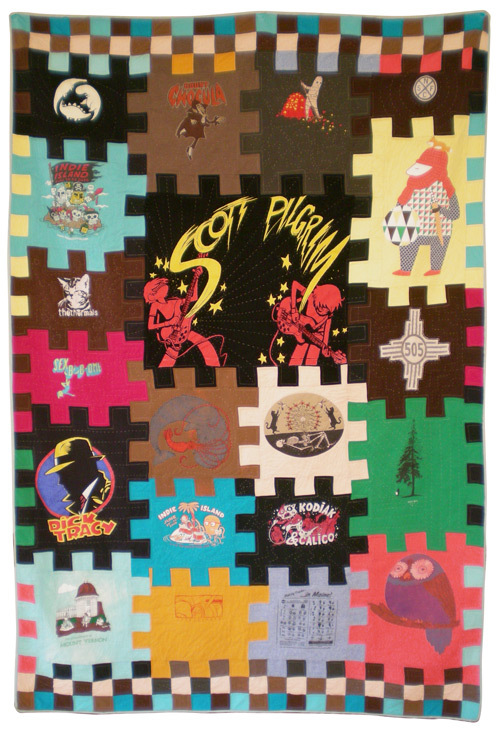 I just finished a t-shirt quilt for my friend Liz. She saved a bunch of t-shirts that she had stopped wearing but didn't want to get rid of. I put a little more planning into putting all these different t-shirts together in an interesting way. 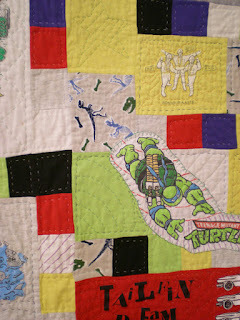 Liz didn't really care how I put it together and she had seen the quilt I had made for myself. I went with a jigsaw puzzle theme to connect all the images. 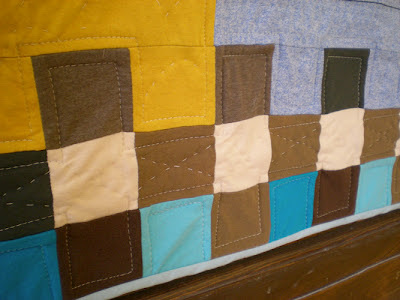 I pieced all the panels together by machine and did a combination of machine and hand stitching to quilt it. Finished size 62 in. x 90 in. A detail with Alec's t-shirts design right next to his friend Aaron's awesome shirt design. Obviously I did this on purpose since they're friends, so their t-shirts are friends too. 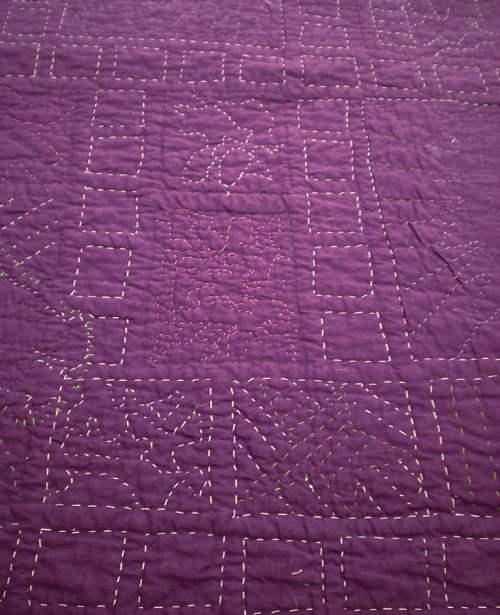 A detail of some hand and machine stitching on the bottom edge. Knit is stretchy so it can be forgiving which is usually nice except on a quilt when you want no stretch at all. 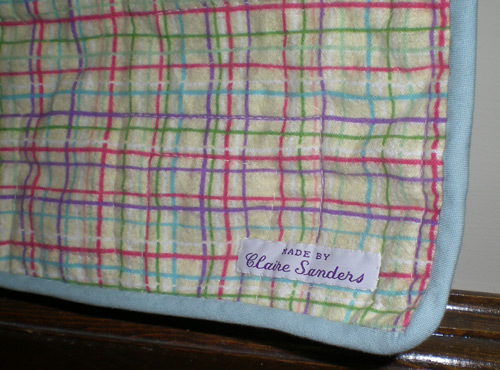 Liz chose a soft, cotton flannel printed with multi-colored stripe plaid for the back. I finished the edges with a light blue cotton bias that was left over from the wedding quilt I made. That's brilliant. That's really brilliant. One thing that has helped me is putting lightweight woven fusible interfacing on the back of the main shirt images, this makes it so it don't stretch and distort like knit fabric wants to do. It makes it a little easier to keep your panels straight and neat while you're sewing them together. I've also seen other people use woven cotton fabric as the pieces in between the t-shirt patches, this can also make it easier and faster to sew. Email me (address is in contact tab) if you want a commission rate, as I'm sure you can tell these quilts takes awhile and are mostly labors of love since they can be a little tedious.